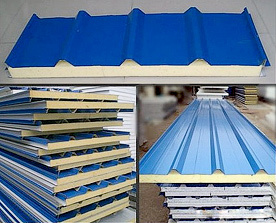 Upper and lower metal exterior sheets sandwich with the PU foamed. The exterior metal sheet can be color steel sheet, aluminum & zinc coated steel sheet, aluminum coated steel sheet and embossed color steel sheet, etc. 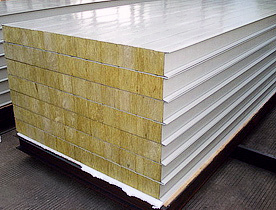 PU sandwich panel is the best heat resisting & maintaining materials is acknowledged in the world at present. Features include: Light weight: 10-14kg/m2 - excellent heat resisting: 0.0175kcal/m.h. °C. - easy assemble and heavy load bearing capacity . Can select different thickness of the composite panels in accordance with the proof load bearing and purling distance. Economical materials with excellent heat insulation. Application: Suitable for various roofs and walls referring to the large size factory buildings, Storages, exhibition halls, gymnasiums, freezing stores and purification, workshops (temp-keeping, heat insulation, weight bearing, weatherproof, rich color and good appearance). 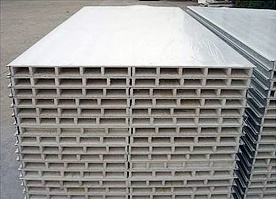 It is a new kind of building board with quite light-weight (10-14kg/m2), just 1/20—1/30 weight of the concrete materials. It has advantages of low price, quick construction speed, beautiful shape and high toughness.